A couple of weeks ago, I finally finished my revisions. Total time invested: over nine months. That's a lot of days at the computer, people. A whole lotta days. And the second I finished, I sent the manuscript to my Critique Partners and Beta Readers, and then settled into a fun Saturday night and relaxing Sunday. But, when Monday rolled around, it wasn't long before I found myself at odds with what to do. So, naturally, I watched every episode of the current Big Brother Canada season, played all of my lives in Candy Crush, and then, when I got a little peckish, went out for a donut. Because that's what we Canadians do when we're bored. We eat donuts (stereotypes exist for a reason, people, haha). So, off to my local Tim Hortons I went, in search of sugary, circular pastries. And as I drooled over looked at all the donut options nestled behind the shiny glass case, I began the Which Donut Will I Get Decision Dance, which is kind of like the I Have To Pee Dance, but with less urgency. Usually, my decision is easy, as I'm partial to the Vanilla Dip, but the sprinkles weren't colours that I liked and because aesthetics are important to my life, I was forced to reevaluate. You probably think I'm joking, but I'm not. Haha! And it was while I mulled over the other options that I noticed a sad little donut in corner of the case: the Old-Fashioned Plain. "Now who the heck would every want to eat that?" I thought to myself. "No wonder it's in the bottom corner where you can hardly see it. It's dull, and small, and kind of sad. Especially when you compare it to the yummy Honey Dip donut. Yeah, they should probably just stop making those things all together because who the heck wants to eat a such a sad donut?" And because I was still accustomed to having to think about my manuscript ALL THE TIME, I was suddenly hit with the realization that manuscripts are a lot like donuts and, although it was hard to admit, my very first draft was just like an Old-Fashioned Plain, which is when I got a big ole love surge for everyone who’s ever read my manuscripts because it was their feedback that inspired the revisions that got me out of the Old-Fashioned Plain zone. So, without further adieu, here's a delectable pictorial explanation of how reader feedback makes for a more delicious manuscript. Keep reading and it'll make sense, I promise. Haha! Yahoo! You sat down and managed to hack out a whole novel! All by yourself! There are words! And sentences! And paragraphs! Not only that but there are characters, plot arcs, and settings too—everything a book needs to have! You’ve even read through it a couple of times and it's ridiculous how good it is. You should just quit your job and write for the rest of your life! Why did you think it would be so hard? Writing is easy!! But just like the honeymoon period of any new relationship, there’s a pretty good chance that you're unbelievably biased, and no matter how good you think your manuscript is, it's fairly likely that all you have is an Old-Fashioned Plain donut. You see, the dough of the Old-Fashioned Plain donut is dense and there isn’t much pizazz. It has the basic ingredients that all donuts need, but it’s a bit dry. Only kind of sweet. It has the potential to be amazing, but as it stands, it's just a sad donut in the corner that most people wouldn't look twice at. Let alone get psyched about. Now, if all you want to do is write novels for yourself, then who cares if your work stays like an Old-Fashioned Plain donut? Again, I stress that this is totally okay. Writing is something you do because you love it and nothing should ever deter you from doing what you love. 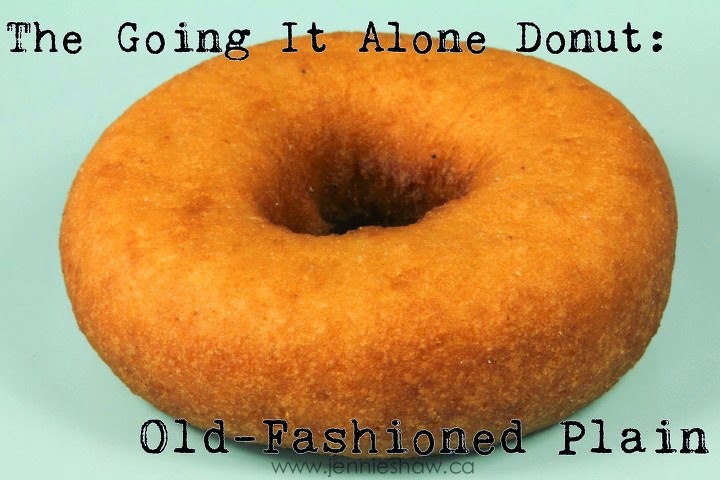 But, if you want to put your Old-Fashioned Plain donut in a store for people to buy, there’s a distinct possibility that you’ll get overlooked in favor of…well…a more flavourful treat. Just like I did when I went out for donuts and hated pretty hard on the Old-Fashioned Plain. But in order for your manuscript to become a more flavourful treat, you need to branch out because you don't know what you don't know and unless someone tells you what you don't know, you'll never be able to fix it because you'll never know what to fix. If you feel like Kim after reading the last bit, go back, read it again, and then we'll move on to how just a little bit of feedback can make your basic donut much tastier. Haha! So you’ve decided that you want to take your Old-Fashioned Plain donut manuscript to the next level! Yay! The good news is that means your manuscript is about to get better. The bad news is that you actually have to let someone read it. Haha! I know when I was starting out and needed a reader, the first thing I thought was: Hey! My BFF loves the kinds of books I write! In fact, she was the one who told me that I should write a book in the first place! I’ll get her to read it! YAY FOR FEEDBACK FROM MY BFF! So, I gave it to her and then stared from the corner as she read it waited very patiently for her to finish. And you know what? She loved it! More than loved it, actually. She said it was the greatest book she’s ever read! There were a few things she was confused about, and she found some problems in my timeline, but aside from that, it was perfect! Yay!! So, armed with the minor feedback from my BFF, I made some revisions and then began to query my manuscript, CONVINCED that I was three seconds away from getting a six-figure book advance and becoming close personal friends with Jennifer Weiner. But soon, my confidence began to wane. Apparently, although my BFF loved my manuscript, agents didn't, which was demonstrated by the vast amount of form rejections that clogged up my inbox. I got a few non-form rejections with horrifically vague comments like: non-sympathetic protagonist and editorial work needed, which is when I realized that although I'd made a few changes to my manuscript, tweaks here and there, not much had changed. Just like the jump from an Old-Fashioned Plain donut to a Honey Dip. The dough of my manuscript was fluffier because I'd kneaded it more (I don’t know if this is actually true for donut dough but it works for me here, so it says, ha) and the thin coat of glaze made it shine, but it was still pretty plain. It was better than what I started with, but there was still major work to do. The lesson I learned? Feedback from a BFF or equivalent is an absolutely natural first step for a budding writer, but it's not the kind of feedback you need in order to produce a really great manuscript. Sure, there are exceptions to this rule. Like, for instance, if your BFF is Jennifer Weiner. Or Martina Cole. Or Marian Keyes. (I think you see my point here, so I’ll stop.) But if that's not the case and you want to write for publication, you need to seek out a more unbiased opinion. Side Note: The manuscript I referred to here has been shelved. Indefinitely. Because it was my first and not very good. But thanks for all the encouragement, BFF! LOVEYOURFACE! Rest assured that giving your work to a Beta Reader is a scary, scary thing, but if you’re lucky enough to get a good Beta Reader (or two) then the payoff is worth the sleepless nights fear. The good news is that you’ll hopefully get an idea of how your manuscript stacks up to the BIG names, because your Beta Readers will be fans of books in your genre. The bad news is that you’ll probably get an idea of how your manuscript stacks up to the BIG names because your Beta Readers are familiar with your genre. Haha! But seriously, it’s a double-edged sword and a good chunk of a Beta Reader’s feedback will probably break your heart, which is why it’s so different than feedback you would get from a BFF because a Beta Reader doesn’t have to worry about what will happen when you sit across the table from each other the next time you have a birthday. 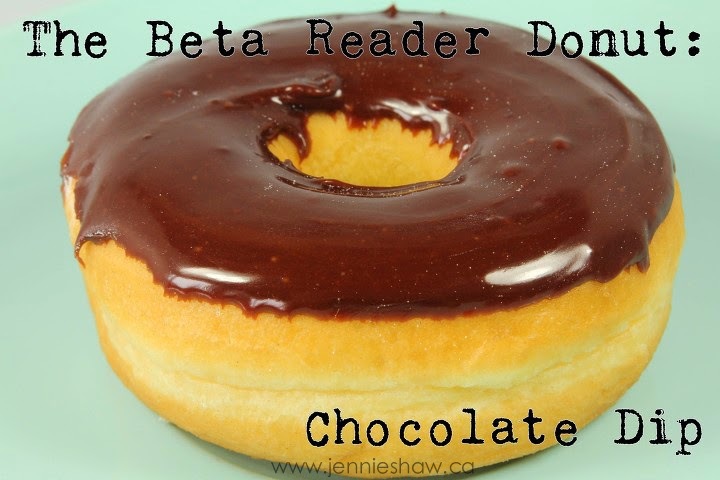 But if you can suffer through the pain absorb the feedback meant to strengthen your work, and revise accordingly, when you're finished, your manuscript will be just like a delicious, Chocolate Dip donut. It will be light and fluffy like the Honey Dip donut, due to the extra kneading, but there’s an extra layer of goodness: chocolate. A lot of people love chocolate, you know. In fact, some people even live for chocolate. And in a lot of cases, chocolate would be enough to attract, and then satisfy someone's craving. After all, it's chocolate on a donut. But…there’s still some potential to produce an even more delicious donut. I know, I know, it sounds crazy, but it's true. Which is exactly the same thing when it comes to Beta Reader feedback. It's far more helpful than BFF Reader feedback, and can create a tasty manuscript but there's another type of feedback that can make your manuscript downright delicious. From my experience, a Critique Partner is different from a Beta Reader because they are often another writer who…well…critiques your work. It’s a partnership—a close relationship that’s cultivated in the trenches of writing warfare where you band together and drink all the wine create epic fiction. So, it should be no surprise that it’s hard to find a good CP. Like, really hard. But once you do (and I swear that you will, eventually) this is where the real magic happens. 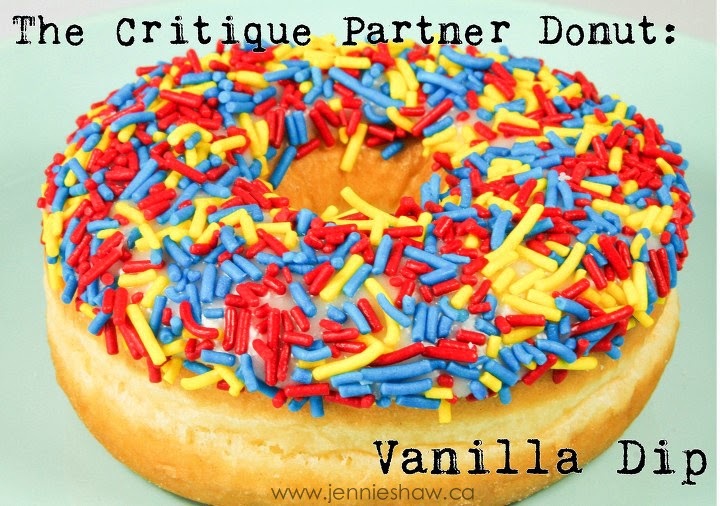 With feedback from a Critique Partner, you'll have the soft, fluffy dough from the BFF Reader Donut, the icing from the Beta Reader Donut (in this case though, vanilla instead of chocolate) and then the sprinkles, which are the little something extra. Why? Because a CP won't let you do good work, but will push you to do your awesomest work. And although your CP loves you like a BFF, they know that constructive criticism is the best way to show that love. For instance, I like to say to mine: If you love me, you WILL FIND THINGS THAT DO NOT WORK IN HERE. The good news is that after your CP gives you the soul crushing suggestion that you may need to remove a secondary character that you love because they're ruining everything, which would require an entire rewrite that you don't want to do even though you know your CP is right, the feeling you get after you accept that fact, make revisions, and then give it to your CP who says YOU NAILED THIS, is comparable to the feeling one would get after running a marathon, blindfolded, only way WAY WAY WAY better! Probably, anyway. And do you know how I know that? Because it's happened to me. More than once (Thanks, Scott and Gina!). Also, there's the added bonus that you get to critique your CP's manuscript, which always ends up pointing out things you need to adjust in your own work. A double-score, that little bit is. Sort of like getting a donut and a Timbit at the same time. THE SAME TIME, people. And who doesn't want more donut? Not this gal. Of that, you can be sure. So there you have it: my interpretation of how getting reader feedback makes for a more delicious manuscript. In particular, Beta Reader and Critique Partner feedback have been invaluable for me and it was through their insightful comments/concerns/suggestions that I was able to stretch myself and grow, therefore upgrading my Old-Fashioned Plain manuscript all the way to Vanilla Dip status. And I will be forever grateful to them because, really, which one of these would you want to eat first? Note: If you pick Old-Fashioned Plain, I'm not sure we can be friends anymore. Haha! 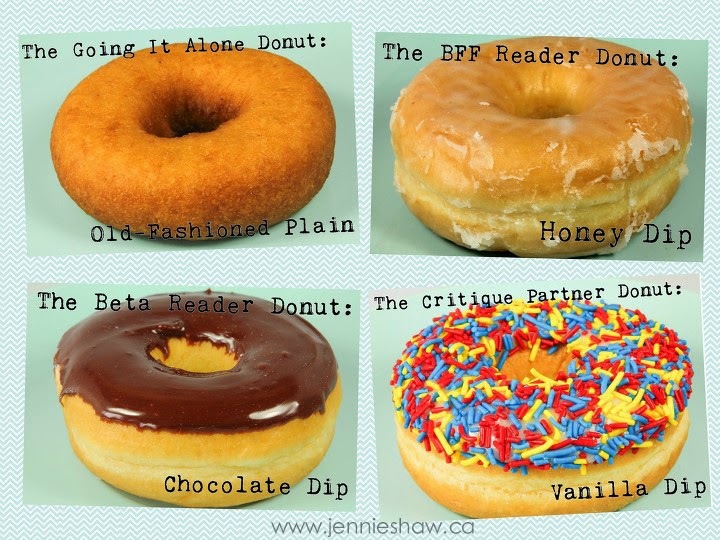 Also, I understand that you may be thinking: Hey Jennie, how come the donut’s names are Honey Dip, Chocolate Dip and Vanilla Dip but they're all way different? Shouldn’t it be Honey Glazed and/or Vanilla Dip With Sprinkles? Well, I agree. But I don’t make the names. Go talk to Timmies. They’re the ones in charge. Ha! So writers, what do you think about this? Do my delicious examples ring true? Where do you get your best feedback from? Jennie I just love how you write and tell stories! 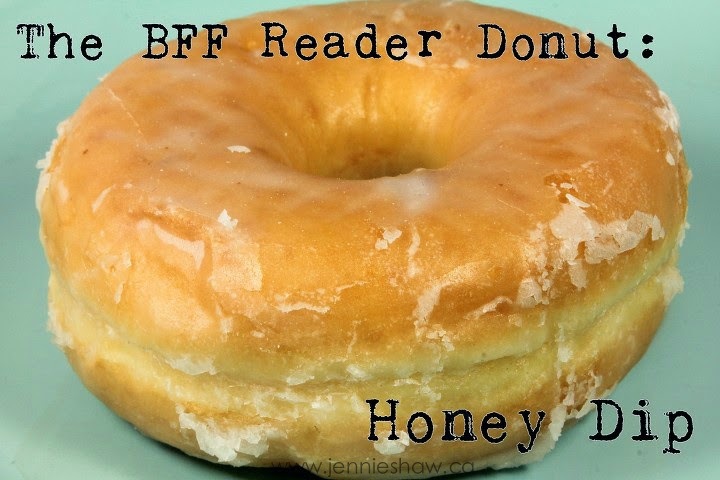 I'm so the BFF reader because I'm a much better cheerleader and I don't care for sprinkles...LMAO!!! And also for taking a break between revisions and the next round of writing. The brain needs a break. And apparently the mouth needs donuts. I'm currently doing my final (I hope) edits on the manuscript for my sequel and then have a few people slated to review it. Your post is awesome and perfect timing for me, but now I want some donuts!